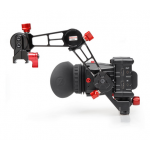 The Stinger Plus rig is an in-line system best used on long shooting days. 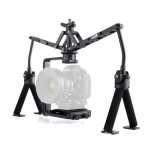 It features our Studio Baseplate for Canon C100-C300-C500 Cameras which attaches to the camera with 3/8” 16 and ¼” 20 screws. This baseplate features a pair of 15mm rods that are 12” long running through the length of the baseplate. You can quickly reposition the rods for various lens lengths by loosening the 2 levers, one on each side of the baseplate. On each side of the baseplate there is also a set of 15mm lightweight spaced holes. The side holes take 15mm female rods that are locked via an Allen screw. 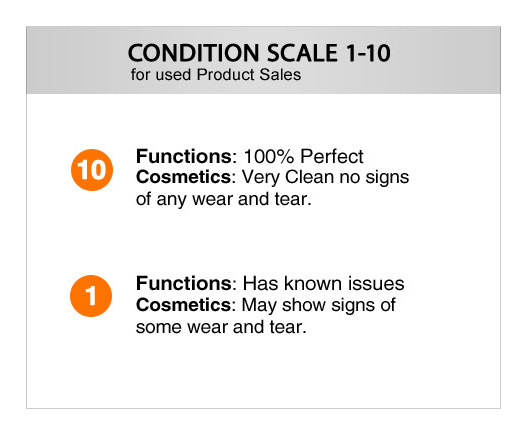 This gives users a virtually unlimited amount of mounting options. 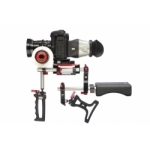 The side holes can be used for an EVF, Zacuto articulating arms, rods and more. The baseplate has standard ¼” 20 and 3/8” 16 holes on the bottom for mounting the rig onto a tripod. The Stinger Plus differs from the Stinger by including a Zwiss Plate instead of a Z-Lite weight. The Zwiss Plate allows you attach external recorders and professional batteries such as V-mount style or 3-stud gold mount. 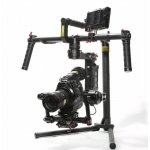 This is particularly useful for Canon C500 users. The professional batteries and/or recorder act as a counterbalance to balance your rig. The Stinger Plus also comes with one Wireless Plate Pro attached to the side of the Zwiss plate to hold wireless mic receivers, small recorders, etc.. There is room for one extra Wireless Plate Pro. When sitting on a tripod, the Zwiss Plate can mount from the rod ports on the side of the baseplate (via two short female/female rods, not included) for better balance. The Zwiss plate has been tested with the following recorders- Onboard S, Ki Pro Quad. 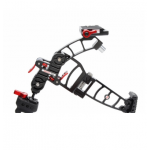 The Gemini 4:4:4, or any other ¼ 20” accessory, can be attached with an articulating arm coming from the side of the baseplate, attached to a rod, or attached to an empty rod port on the Zwiss Plate.